(Phys.org) —A collaborative research team from Macquarie University and Sydney University have discovered that young (hatchling) lizards are capable of learning complex tasks, particularly if they hatched from eggs incubated at warmer temperatures. The team, lead by Associate Professor Martin Whiting from Macquarie University's Lizard Lab, tested the intellectual abilities of 14 week-old three-lined skinks by challenging them to first remove a cap covering a 'well' to access a food-reward, and secondly to correctly identify which coloured cap shields the food-reward. "In the final stage of the testing, we complicated the challenge for the lizards by switching the reward to a different container, with a different coloured lid," said Associate Professor Whiting. "We found that the lizards did not rely on previous spatial locations to locate the reward, but could discriminate between the colours to identify where to look first. "Some of the lizards we tested never really got it, but others solved every challenge we threw at them. Our results add to a growing body of literature that shows that at least sometimes, lizards can be far smarter than many scientists previously believed." 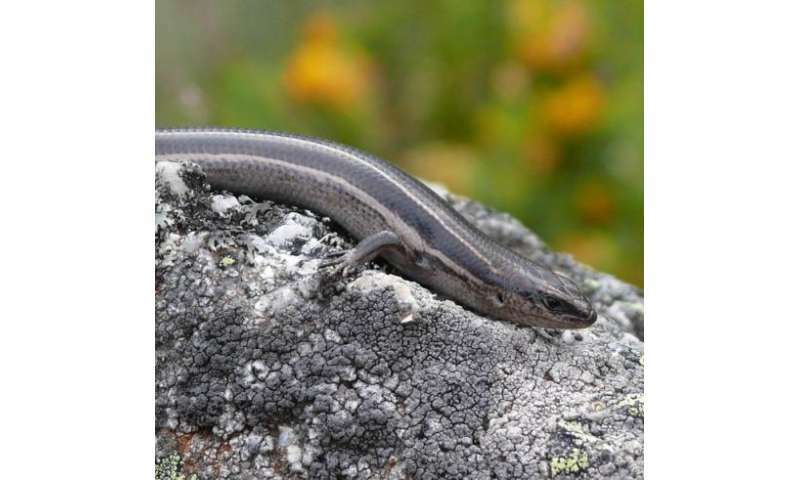 A key element of the study was to compare the learning rates and abilities of lizards that had been incubated in warmer compared to cooler temperatures, with the former performing more successfully overall. "The lizards from the 'hot' incubation temperatures were generally larger, but even the largest 'cold' incubated hatchlings did not progress beyond the training phase. Therefore, success at the motor task was due to more than just body size," said Whiting. "It looks like the temperature of a nest influences the problem-solving ability of a young lizard. These results are significant because they underlie the importance of an animals developmental environment on learning ability and cognition." The research paper has been published in full online in the journal Behavioral Ecology and Sociobiology.